TEPSA coordinated a study for the European Parliament’s Subcommittee on Human Rights (DROI), authored by Beata Faracik, President of the Board of the Polish Institute for Human Rights and Business. 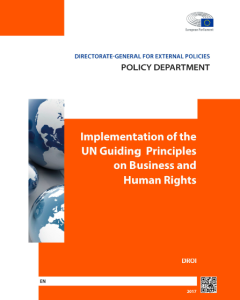 This study reviews the progress of implementation of the UN Guiding Principles on Business and Human Rights (UNGPs) in non-EU countries, five years after their unanimous adoption by the United Nations Human Rights Council in 2011. Much progress has already been achieved, with i.a. relevant key international standards like OECD Guidelines for Multinational Enterprises becoming aligned with the UNGPs, new tools being developed to provide guidance to governments and stakeholders and a basis being set for constructive discussion. This led to increased awareness and better understanding, building trust and engagement among various stakeholders. Yet, despite all efforts, business-related human rights abuse is still a serious problem. 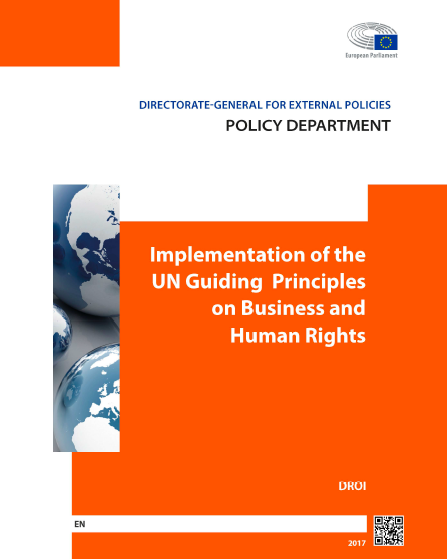 Further implementation of the UNGPs and related instruments is thus necessary, with special emphasis needed on access to remedy and justice for victims of business-related abuses. Less declaration and more real political will is needed, as states’ commitments to develop National Action Plans implementing the Guiding Principles have been far too slow to materialise, with only twelve NAPs being launched to date. Yet, the number of ongoing processes is promising, particularly in South America, although we have yet to see how meaningful and future action oriented their outcomes will be.